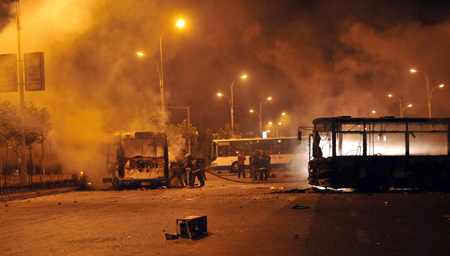 URUMQI: Death toll has risen to 156 following the riot Sunday evening in Urumqi, capital of northwest China's Xinjiang Uygur Autonomous Region, according to official sources. Li Yi, head of the publicity department of the Communist Party of China (CPC) Xinjiang regional committee, said early Tuesday morning that the dead include 129 men and 27 women. Li added 1,080 people were injured in the riot. The police put the death toll at 140 as of midday of Monday. Among the 16 newly reported dead, some died in hospitals and others were recovered from street corners, the regional police authorities said Monday night. Police have got clues that some people were trying to organize more unrests in Kashi City, Yili Kazak Prefecture and Aksu City. In Urumqi, the regional public security department commanded raids to several groups who allegedly plotted unrests in Dawan Township in Tianshan District and a former race course where floating population gathered. A number of suspects were arrested during the raids while there were no casualties among police officers. In Kashi, more than 200 people trying to gather at the Id Kah Mosque, the largest mosque in China, were dispersed by police at about 6 p.m. Monday. Most of the shops in the Kashi were closed amid the current tension. Only several restaurants run by Uygur people were open at about 10 p.m., the time for night snack in a normal period. Few people were seen in the streets. The police had set checkpoints at crossroads from the Kashi airport to the downtown areas.